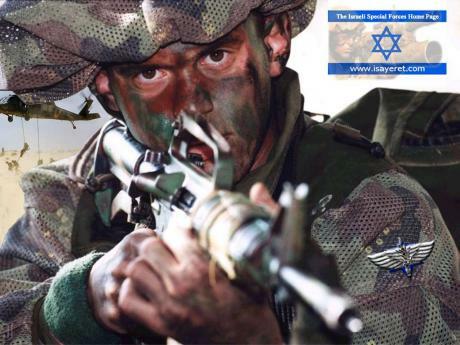 * Activation of Special missions units before the declaration of the Israel state. * 1948-1974: The establishment of the SF units after the declaration of the Israeli state. * 1974: The acquiring of Counter Terror and hostage rescue capabilities. * It was the first time the IDF formed a brand new SF unit from scratch, rather then modify a previously exiting infantry oriented unit, like with the Golany brigade Special Reconnaissance Platoon. * It was the first time the IDF formed a unit that received its orders directly from the IDF General Staff (the IDF High Command - MATKAL) and not by a lower sub-command. Photos from the terror attack in the Munich Olympics, 1972. Left - a terrorist seen in the Israeli team building. Right - the heliotrope that was supposed to carry the kidnappers and sponges to safety burned after a terrorist toss a grenade into to it during a police raid. In the early 1970's Israel was the victim of many CT attacks. In this photo Ehud Barak, the former Israeli Prime Minister, leading Sayeret MATKAL entry team (disguised as refueling personnel) during the Sabena air plane raid, 1972. This mission, officially known as Operation Isotope, was the first successful airplane raid in history. Same as in buses' hostage rescue tactics, the airplane raid techniques developed in the 1970's and in 1980's by Sayeret MATKAL and Unit YAMAM, are used globally even today. Sayeret MATKAL personnel looking at a dead terrorist after the raid in the Mahalot High School, May 15, 1974. The failed rescue which cost the lives of over 20 civilians what the trigger for the acquiring of the current Israeli SF CT and hostage rescue abilities. * An all-new civilian CT Unit would be created under MAGAV, much like the German domestic CT unit - GSG9. This unit was later named Unit YAMAM. * Most of Israel's SF units would acquire advanced CT capabilities, with Sayeret MATKAL and S'13 in the cutting edge. * Sayeret MATKAL and S'13 would form one team in each Unit that will specialize In CT scenarios. These two teams are in fact sub units within the Takeover units and have access to best personnel and weapons available to the units, quite similar to the U.S. Navy SEALs and the Development Group (DEVGRU). Operators from Unit YAMAM during bus hostage rescue training in the late 1970's. Note that all operators are armed with M16A1 then a rare item in Israel. Sayeret Golany members preparing for their failed hostage rescue operation in the Misgav Ham Kibbutz, 1980. This operation was a land mark in the Israeli SF tactical history since it was the first mission in which CT dogs from Unit Oket'z were deployed against terrorists. Note the very basic gear carried by the operators - regular uniforms, IMI Uzi SMG, and bullet proof vests. (T'zva Shamayim - T'ZAVACH", in Hebrew) stated which unit does what and when. T'ZAVACH is basically the plan by which Israel fights terrorism both domestic and foreign, until this very day.